For my daughter’s 10th birthday, she asked for “a white cake with colorful swirls and chocolate icing with green and pink decorations.” Very specific, and I aim to deliver what people ask for. Not only do I deliver, I like to over-deliver by taking the idea a bit further. 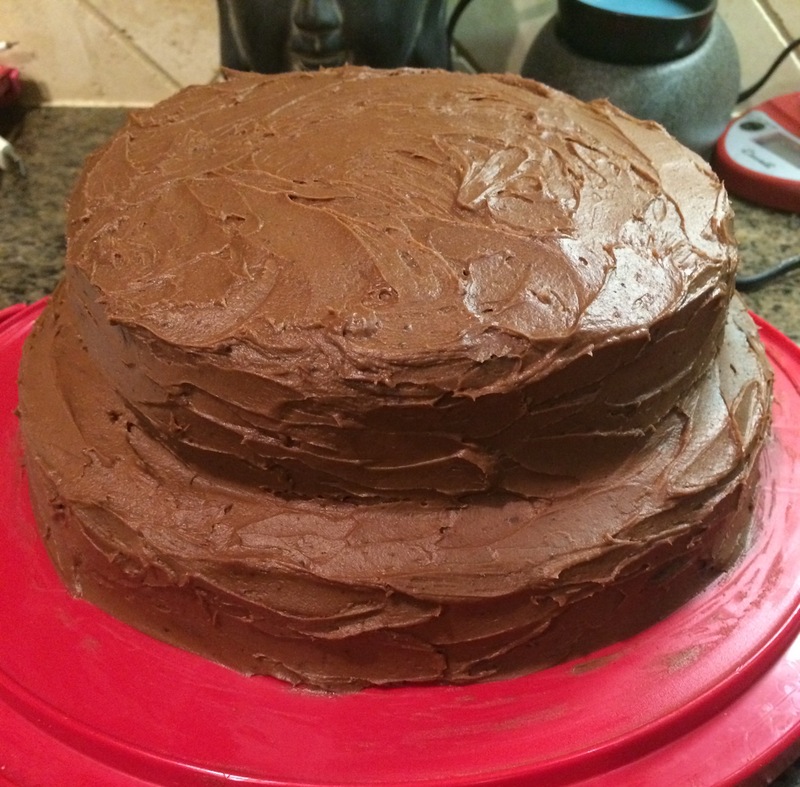 I have a basic white cake recipe that I love to make – it is so simple but so delicious. Super-moist but light, dense enough to stand up to a thick buttercream but airy enough to layer without getting too heavy. I’ve tweaked it over the years ’til I’m happy with the results every time I make it. I took my basic recipe below and doubled it, creating four layers (two 10 inch and two 9 inch) with a different colored swirl inside each. 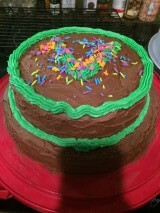 Then I assembled and frosted it with my chocolate buttercream frosting. My daughter and I tinted a bit of the Caramel Buttercream I had left over from the chocolate cupcakes I made for the party (I like for people to have options, and I also like to stuff my guests uncomfortably full – that’s my love language) and used it to add decorations, along with roughly 2 pounds of sprinkles (I exaggerate, but that kid is seriously pretty heavy-handed with the edible glitter). Let me know how yours turns out. The color combinations are endless and you can swirl together as many as you like. Using your stand mixer or an electric hand beater, cream butter and sugar together on medium-high until light and fluffy (about 5 minutes). In a separate bowl, whisk together flour and baking powder. In another bowl (sorry, I’m really making a mess of your kitchen) whisk together the egg whites, milk and vanilla extract. Add 1/4 of the flour mixture to the butter mixture in the mixing bowl and beat for a couple of minutes, then add 1/4 of the milk mixture and beat ’til incorporated. Repeat this process until all dry and wet ingredients are incorporated into the butter/sugar mixture. You’ll probably need to stop the mixer a few times to scrape down the sides of the bowl so that everything gets combined thoroughly. We’re gonna dirty up more of your dishes now. 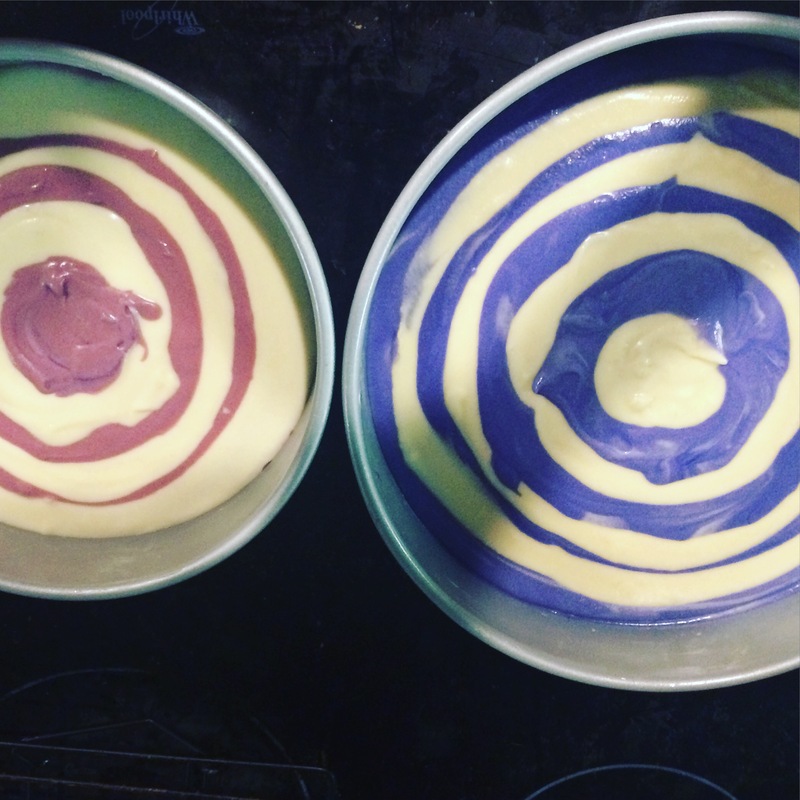 Depending on how many colors you want to make, evenly divide the prepared batter into separate bowls. Using a toothpick or the tines of a fork, dip a tiny amount of the gel food coloring into each bowl and mix thoroughly into batter. Repeat as needed to reach the desired intensity for each hue. Bake cakes about 22 to 25 minutes on the middle rack of your oven (or until a toothpick inserted in the center emerges clean). I turn/rotate them halfway through to ensure even baking. Cool in pans on a cooling rack for 5 minutes, then carefully turn out onto rack (I like to put the rack upside down across the top of the pan and hold them together as I quickly flip the pan so that it drops easily onto the rack), remove the parchment/waxed paper and let the cakes cool completely on the rack before frosting. Add cocoa powder to bowl of stand mixer or large bowl that you can use your electric hand mixer in. Whisk powder thoroughly to remove any lumps. Reduce speed to medium and add 1 cup of the sugar and 1 tablespoon of the milk, then crank the speed back up to high for a minute or two until well-combined. Repeat this process, slowly incorporating the sugar and milk until it’s all combined with the butter (you’ll need to frequently stop the mixer to scrape down the sides and beater with a spatula). Add the vanilla extract and beat on high for another two minutes. ** If frosting is too dry/hard, add a little more more milk – a tablespoon at a time – until it reaches the right consistency. If it’s too wet/soupy, add a bit more confectioner’s sugar – again, a tablespoon at a time – until the texture is right. 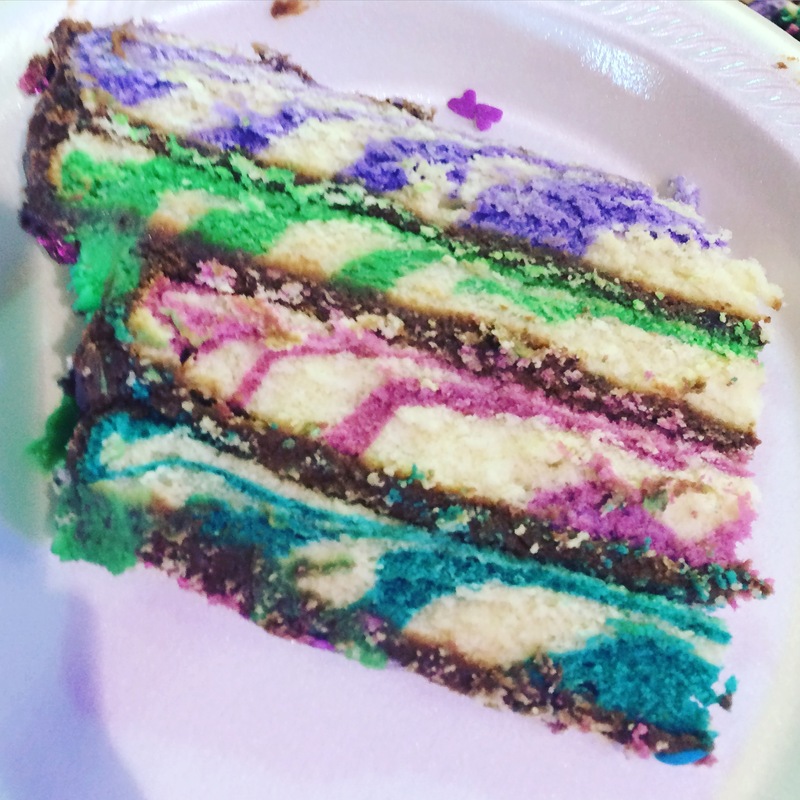 This entry was posted in Sweets and Treats and tagged basic buttercream, caramel buttercream, chocolate buttercream, pynk fitness, pyro maim ya, rainbow cake, swirl cake, tie-dye cake, tie-dyed cake on February 9, 2016 by Dara O'Bannon. Now I really want to go home and bake things!!! Thanks, Baby! I just printed a copy of your recipe. The cake was gorgeous and so good!